the new breed of high powered racing engines that rev in excess of 17,000 rpm. G&S have been CHS’s manufacturer of choice since 1976 producing our unique designs to the highest standards and have received approved supplier status from many of the major OEM and high performance manufacturers, such as Cosworth ‘Approved Supplier Scheme’ and Rolls Royce Motor Cars ‘Supplier Assessments’. Together, we have produced many victories for our demanding clients and restored many rare engines to a better than new finish. Cylinder Head Shop is also G&S’s preferred supplier and manufacturer of valve guides for their valves and customers. In 1980, G&S purchased its own forge, based in the West Midlands, allowing it to manufacture purpose made forgings and over the years. Due to the increasing complexity of some of the shapes required by its racing customers, G&S Valves then purchased a number of CNC lathes, grinders and CAD systems to produce these advanced designs. G&S holds a comprehensive stock of high quality valve steel and can upset forgings from a vast range of die forms to produce suitably close limit forgings to suit most applications. They have the facilities to perform various types of heat treatments, bi-metal valves and hard stellite seat facing. The valves start their life as a plain steel rod which is then electrically upset to form a bunt, then forged into a close limit forging. 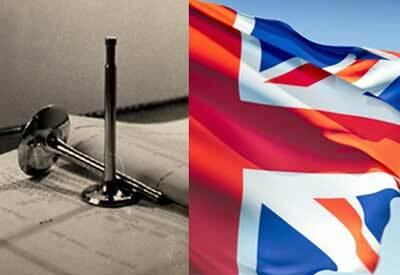 After being forged the valve goes through a number of machining and grinding operations at the UK based factory. Click to play, Nucleus valve production at the G&S forge. Various treatments are available to enhance the life and performance of your valves. Whilst others manufacturers use Hard Chrome or Tufftride their valves, G&S uses ‘Diamond like Carbon’ and ‘Pulsed Plasma Nitriding’ treatments. DLC a Plasma Assisted Chemical Vapour Deposition process which gives a hard layer of 4500 Hk over the complete valve of 3 – 5 microns in depth. The anti-friction qualities are greatly improved as the coefficient of friction (Al2O3) is 0.1 and the process is applied at a relativity low temperature of between 200-300 Deg. C, after the valve has been Plasma Nitrided. Plasma Nitriding gives the DLC coating enough strength to be able to withstand the high contact stresses, and increases in wear life. Valves for internal combustion engines must have high resistance to thermal stress caused by frequent temperature changes. They must remain ductile but acquire good anti-friction properties to reduce wear in the area of the valve guide. The valve seat must be able to resist the corrosive effects of hot exhaust gases from the engine. Pulsed Plasma Nitriding improves the resistance to wear and the anti- friction qualities by increasing the surface hardness along the valve stem, while retaining the inherent corrosion resistance of the material at the valve seat. Pulsed Plasma Nitriding allows high temperature metallurgical reactions to occur at low work surface temperatures, plasma is produced by applying high voltage through a low pressure gas (a mixture of hydrogen and nitrogen) causing it to ionise, using this high energy (but thermally low temperature), plasma will diffuse nitrogen into the surface of the valve. A stellite 6 deposit is placed on the exhaust valve seat face enhancing the seat hardness to a Rockwell’C’ of between 38 to 42 HRc which enables it to be used with unleaded fuel or highly stressed engines e.g. : turbo-ed, supercharged or engines that are generally hard on valve seats. Standard material for motorcycle valves is EN52, a steel first introduced over 70 – 75 years ago. Cylinder Head Shop’s designs use 214N, a new austenitic stainless steel which retains its hardness even up to temperatures of 800 Deg. C and possesses excellent rupture strength under high temperature conditions, combined with good creep and impact values. The high chromium content of 214N gives good scaling resistance and has greater corrosion resistance against Chlorine attack.